Whether visitors are attending the film screenings or simply soaking up the indie vibe, Park City during the Sundance Film Festival is an exciting place to be. The curtain rises on the 11-day festival Thursday, January 20, with sanctioned events continuing through Sunday, January 30. The good news for those still looking to attend: lodging deals in Park City are still available. ResortQuest by Wyndham Vacation Rentals is offering 25% off lodging in Park City's Deer Valley during the Sundance Film Festival. 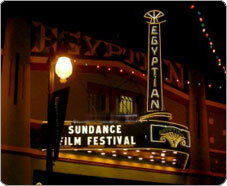 ResortQuest Park City is an Official Lodging Sponsor for the Sundance Film Festival, providing a smart lodging option for the festival's alumni volunteers, as well as the thousands of filmmakers, film fans and celebrities that travel to Park City for the event each year. Details and more vacation specials from ResortQuest can be found online at www.ResortQuestParkCity.com. During the Festival, Park City is primarily a walking town, making it even more important for travelers to consider location when selecting their lodging. ResortQuest offers numerous accommodations within walking distance of the Sundance theaters and venues — including the Filmmaker Lodge, Sundance House and the iconic Egyptian Theatre — in Park City's Historic District.